HIV JUSTICE WORLDWIDE PARTNERS* AND SUPPORTERS in front of the Brighton AIDS Memorial on New Steine during our second strategy meeting in Brighton, March 2017 - (L-R): Nicholas Feustel (Video Advocacy Consultant, HIV Justice Network*); Sean Strub (Sero Project*); Catherine Murphy (Amnesty International); Evgenia Maron (EECA Consultant); Sylvie Beaumont (Research/Outreach Co-ordinator, HIV Justice Network*); Seth Earn (AIDS Free World*); Patrick Eba (UNAIDS); Laurel Sprague (formerly HJN’s Research Fellow on HIV, Gender and Justice, now Executive Director, GNP+*); Edwin J Bernard (Global Co-ordinator, HIV Justice Network*); Lynette Mabote (ARASA*); Richard Elliott (Canadian HIV/AIDS Legal Network*); Naina Khanna (PWN-USA*); Julian Hows (GNP+*); Ferenc Bagyinszky (AIDS Action Europe); and Sally Cameron (Senior Policy Analyst, HIV Justice Network*). Other participants at the meeting, but not pictured here, were: Sophie Brion (ICW*), Lisa Power (Chair, Supervisory Board, HIV Justice Network*) and Boyan Konstantinov (UNDP). Read about the values and principles guiding our work. 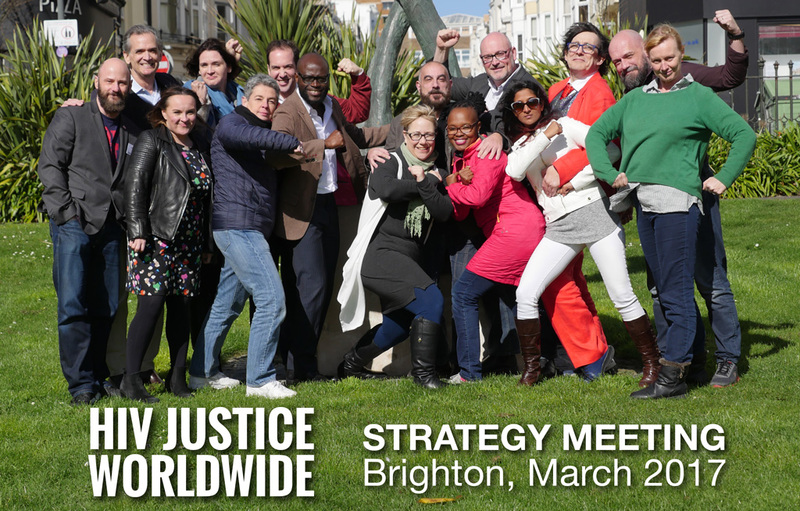 HIV JUSTICE WORLDWIDE was founded in March 2016 during a meeting in Brighton, UK that was funded by a grant from the Robert Carr civil society Networks Fund.